My Dad knew very little about his birth family beyond the fact that he was born in the humblest of circumstances in a mining town in a poor industrial area in England. He was the seventh of eight children, his two oldest siblings having died in a fire. 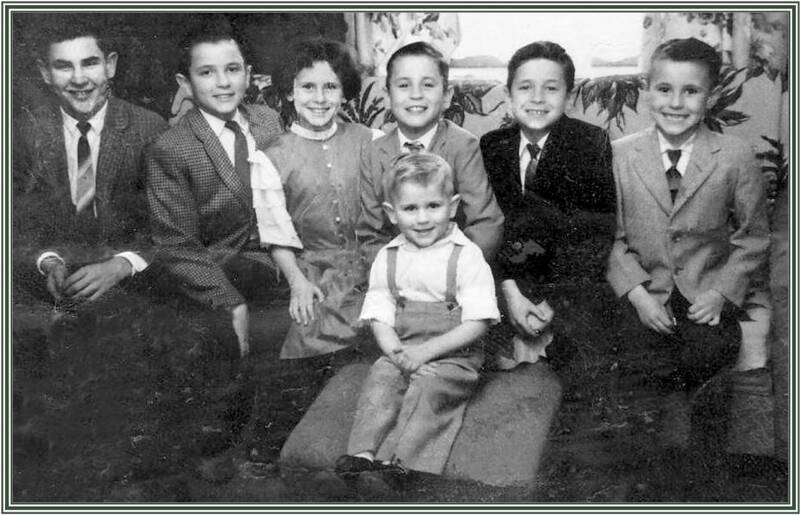 Dad and his five sisters were placed in an orphanage when he was three and Dad spent eleven years in a Bernardo residence. 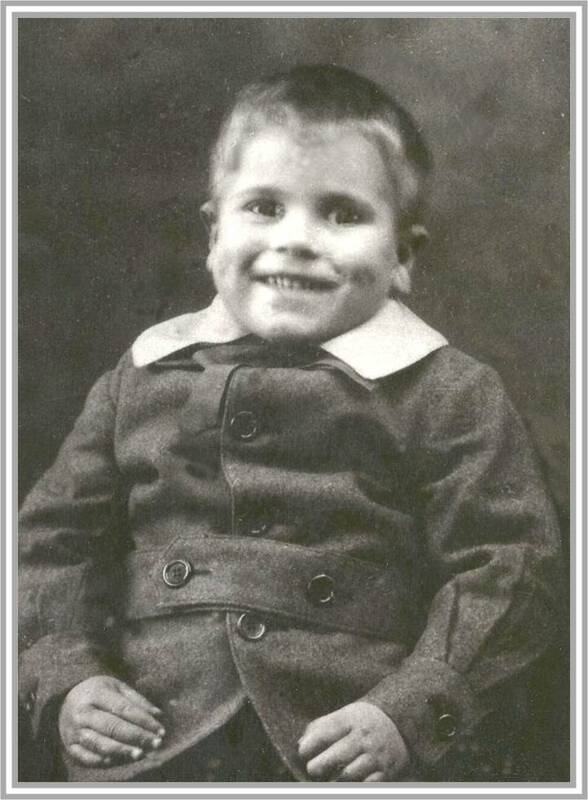 Residential care reached its height in the 1930s, with 8,000 British children living in nearly 200 homes across the country. Life is the homes was run on strictly disciplined lines and children were instilled with a sense of responsibility and self-sufficiency. Children were expected to rise early and spend their waking hours cleaning their rooms, planting gardens and carrying out maintenance work. All aspects of life were tightly controlled, family contacts were not permitted and they were not allowed to see their birth or family records. 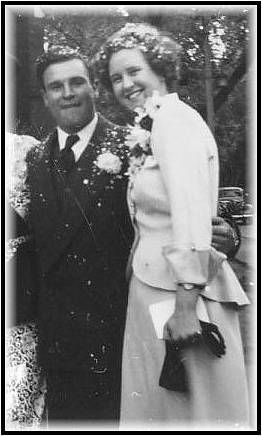 Many, like my father, and his sister Jane were sent overseas to places like Australia and Canada where they worked as labours on farms or as domestic help, but were never adopted by the host family. Dad arrived in Canada in 1939 at the age of 14 and was taken in by a farm family near Cornwall. John McRae and his three sisters never married but took in a number of these children. By the time he was 18 Dad had travelled to the west in search of adventure and work and then eventually to Toronto. It was there, while living in rooms in a church that provided an outreach to youth on the streets that Dad met Mom. It was also through the pastor of this church that Dad was introduced to the Lord. They married in 1948 and moved to Denfield to be near my Mom’s family. The next decade saw the birth of their seven children. Money was scarce and for a number of years Dad provided for us by working the night shift at the Ontario Hospital and during the day working with a neighbour, building barns. Our home was pretty basic but we always had plenty of food and lots of visitors to share it with. It was not unusual for Dad to bring home total strangers from work or church to join us for a meal – often to Mom’s horror, as she would have to scramble to come up with enough food – only to have them become lifelong family friends. Over the 34 years that he worked at the Psychiatric Hospital Dad was given ever increasing responsibility and eventually gained the status of Registered Psychiatric Nurse. I had the privilege of starting my own nursing career in a hospital where my dad was highly respected and to hear many stories of the lives he touched there. On one occasion we were struggled to restrain a patient who was thrashing wildly about in the middle of a psychiatric episode. Without her consciously being aware of it, she lashed out and struck me across the face. Suddenly this woman – who was of a substantial size and difficult to manage with five staff – found herself bodily bustled to her room single-handedly by my father who had seen her hit me. The following day, in a more rational frame of mind, she asked what had happened. When she discovered she had hit me the previous day, she was mortified that she had struck his daughter. That was the kind of respect that my father generated from staff and patients alike. As long as I can remember Dad took his faith in God seriously and served faithfully in every church we attended. We virtually never missed a Sunday at church even though the sixteen mile drive to London was often a challenge especially given the fact that cars were always in need of repair and the sixteenth concession was the last road to be ploughed in winter. He instilled that kind of faithfulness in me as well, and my ministry today reflects the kind of devotion to God and the duty of serving others that I learn from my father’s example. Dad also was thrilled to be a father and especially a grandfather. Everyone of his grandchildren sitting here today knows without a shadow of a doubt that my father loved them with all his heart, and would do anything he could for them. His greatest joy was to have his grandchildren visit him. His faith in God allowed him to trust that God would look after his grandchildren no matter what the circumstances of their lives, and he had the amazing ability to see the good in each of them, and encourage them to just be themselves and let God take care of the outcome. I know that if he could speak in the last week when so many came by to visit, he would have asked how they were and spent his time talking about them rather than himself. When I asked Adam, who visited Dad three times in his last week, why he was coming, he replied that Grandma and Grandpa had always been there for him, and he wanted to be there for him. Dad has always been there for all of us. Never once have I heard him talk about how difficult his life was or excuse himself from some obligation because he had been poorly treated as a child. Never has he allowed self-pity to rule his heart or cloud his judgement. When Mom became ill he served her faithfully all the hours of the day, so much so that he was on a first name basis with everyone in her nursing home. His life was characterized by kindness, and his heart was ruled by his love for Christ. Although the circumstances of his death have been a heartbreak for all of us, we know that he is with his Saviour who he loved, and his wife with whom he shared his life. Although there may be many people who influence our lives, each of us only have one father who gave us life. I will be eternally grateful for the father that God gave me. Pam’s Dad passed away this morning at 9 am in the presence of family. As sorrowful as this is, it does mean an end to her Dad’s suffering, and an entrance to his eternal home. Over the last week as he has declined and family visited to say their goodbyes, Dad’s heart and lungs remained strong, allowing many to come by and spend a few precious minutes by his bedside. The family appreciates so much all of these gestures of affection and concern, and we to want to thank you for your prayers and notes. Visistation will be at Forest Lawn Cemetary on Dundas St. East in London, Ontario on Monday afternoon from 2 to 4, and in the evening from 7 to 9. The funeral service will be held on Tuesday, June 29 at 11 am. We encourage Dad’s many friends and extended family to attend. Dad was a wonderful man, whose family and friends are his greatest legacy. Please feel comfortable to come by and visit. If you would like to share a remembrance of an event or an interaction, you may do so through the website of the funeral home at www.mcfarlane-roberts.ca by selecting obituaries and then his name. It might take a few more hours before that is active. Dad’s notice and further information will be in tomorrow’s London Free Press. Thank you once again for your prayers. God has certainly blessed through the sad moments of the last few days, and we rejoice in His perfect will and goodness. The move to palliative care has been a blessing. A private room became available almost immediately, confirming, if any further confirmation was needed, that this was the right decision. A change in Dad’s medication has brought about a significant improvement in his comfort level. He has not regained consciousness, however, so our goodbyes have consisted of gestures and words of comfort that we hope are having an effect at some level. The family is keeping watch throughout the day and night, spelling each other off in a casual rotation that allows for soccer games and work schedules. The shifts overlap so information about the care that has been administered can be passed on to the next family member. Visiters have been frequent, stopping by to say their goodbyes and staying to visit for a while. These visits have been a blessing and an encouragement to the whole family. We do want to thank all those who have dropped by either in person or through the website. If you have pictures of Dad or stories of remembrance would you please send them to us through our mail on this site: steve@spwise.com as we would like to begin to assemble a tribute. The family met today to decide on a course of care for Pam’s father. The options have narrowed critically in the last few days as her Dad’s abilities to function have begun to fail. The neuro-surgery has resulted in physiological damage, leaving her Dad unable to swallow. As a consequence a tube was inserted into his lower intestine in order to feed him. Unfortunately this too has failed, as his body can no longer perform peristalsis, which is a muscle movement essential to the process of moving food through the intestine. Due to this failure the food backed up into his stomach and then through the esophagus and into his lungs. An emergency procedure was able to clear the lung, but feeding by tube is no longer a viable option. The family met to discuss the few options remaining, and it was decided to move him to palliative care and seek to reduce the meds enough to possibly produce a level of consciousness which would allow family members to say goodbye. This was a difficult conversation with a number of varying degrees of acceptance and denial. However the family is coming to grips with the inevitable while still praying for a miracle. The outlook is not good. Practically speaking we are looking at a few days more at most. My first full day back in Canada Pam and I were up early and off to Cambridge to attend church at Forward Baptist. I know that sounds very devout of us, but actually we had a very selfish motive: our grandchildren were going to be in the nursery because that is where Jon and Nic go to church. I had completely forgotten/was never aware that this was going to be Father’s Day. Whe I went into Ben’s nursery classroom he recognized me instantly, dropped his toy and came running over and gave me the sweetest hug. Then he took my face in his hands and stared me right in the eyes and said “I love you Grandpa.” I just dissolved! That was the nicest Father’s Day gift I could imagine. Abi was a little more unsure. She had to see Pam first and then looked at me again and allowed herself a shy little smile. Our friend Kay was in Ben’s nursery and was kind enough to give me a welcome home hug as well. I insisted that we sit in the balcony so I could be close to the nursery, and then excused myself during prayer so I could go and just watch the kids interact with others in the nursery without disrupting them again. It was such a sweet joy to see them again after so long. After church Brian and Bernadine took us back to their place for a barbeque. It is their daughter Tatum who has been travelling with Jon and Nic in Asia. They are a lovely Christian family and not only fed us a terrific meal, but treated us like old and dear friends. We were reluctant to leave, but while we were there Joe called from the hospital and Pam felt impelled to get back to London as soon as we could. When we arrived at UH we met Ray on the way out, pretty close to tears. He like many in the family is finding it hard to come to grips with Dad’s situation. There is a lot of denial and a lot of anger, but slowly it is being replaced with acceptance. It is not an easy process, but God is faithful in these things. Upstairs Randy and Sylvia and their three kids were struggling with the same things. It was good to see Pam take charge of the situation, ministering to her Dad’s physical needs and treating him with such loving compassion. It seemed to cheer everyone’s mood, and by the time Lorri and her two boys arrived we were sharing stories that featured our interactions with Dad and the family, and things were noticeably brighter in mood by the time Lawrence arrived. Dad is in a coma, resting as comfortably as the staff can manage. He is in a ward, but in a somewhat private corner of one so we were able to visit around his bedside. We would go to the cafeteria for coffee and back up to the room again on a rotating basis and easily put in six hours this way. I insisted that Pam come home and allow others to take the night shift. She objected and was angry with me, but I am willing to engage her displeasure if it ensures her rest. She has been at this for over a month and needs to guard her own health to some extent. I see that as part of my role in this. I have always sought not only to be a good father, but to be a good husband as well. I think I always knew that Pam’s Dad was not going to make it. Something in my heart told me that this was going to be his final chapter. After two surgeries and several weeks in hospital he is on comfort measures onlyand not expected to last much beyond the weekend. After extensive measures to attempt to bring his blood pressure, heart rate and body temperature under control, it was evident that he was not likely to respond. He has slipped onto a deep coma and is very much at peace for the first time in a long while. I have changed my flights courtesy of a very understanding agent at Air Canada, and will be landing in Toronto in about 24 hours from now. Pam would of course appreciate your prayers at this time for the family as they get ready for the inevitable. I am so grateful for our faith that enables us to face what will be ahead for us over the next week. Dad is going to a much better place. 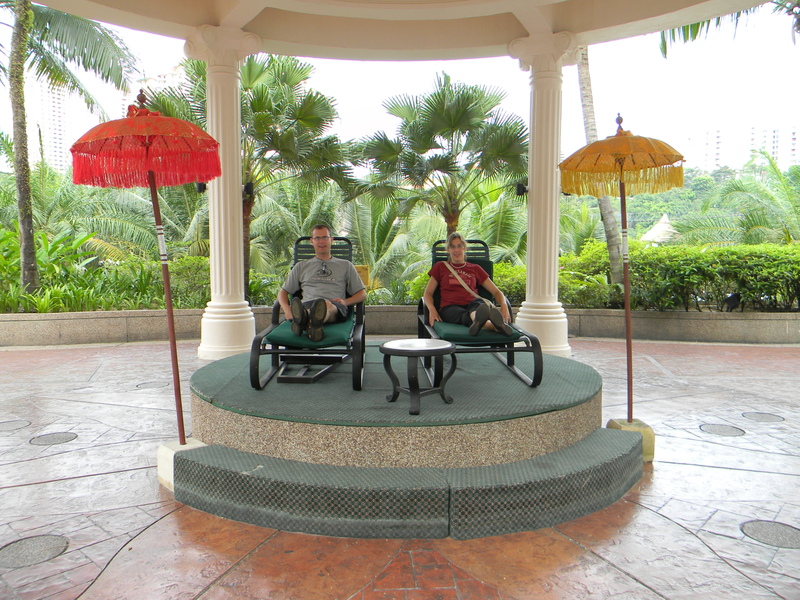 Once again Jon, Nic and Tatum have touched down in Subang Jaya, and once again they are off again, this time in different directions; Tatum to Vietnam to visit a missionary family there, and Jon and Nic up the coast for a little beach time. I’ll get my own holiday soon, so I am not complaining. Then again I do get to live in Malaysia, so I should never complain (but if I didn’t, who would recognize me??). If you are thinking as I am “Um, didn’t they just get back there from Phnom Penh,” you would be right. In fact it was at 7.30 last night that I picked them up from the airport. By the time Jon and Nic had skyped their kids, and Tatum had skyped her parents, and I had skyped my Mom – who was definitely getting lost in the shuffle here – and Nic had got a load of wash in and then hung up to dry, it was getting close to midnight. I had opportunity to reflect on this as the alarm went off at 3 am so I could begin my day by getting Tatum off to the airport to catch her flight to Hanoi. To their credit, Jon and Nic were up as well seeing that Tatum got safely away. By now I should have the route to the airport entered into autopilot. We got Tatum’s bags checked in and headed to the Coffee Bean for our lattes. 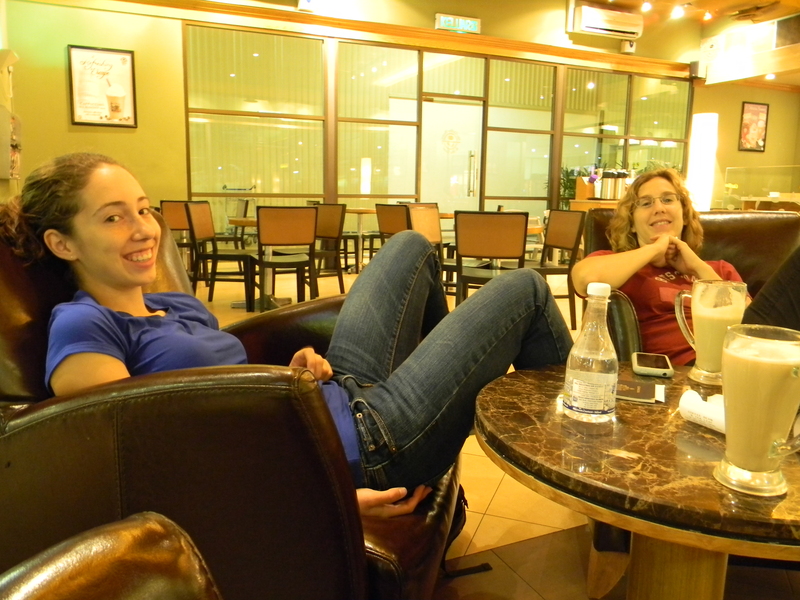 Then once Tatum had gone through the gate the three of us headed back into KL, this time going through Petra Jaya. It was nice and a little bit magical watching the sun come up over new administrative centre of Malaysia with its distinctive building and bridges. 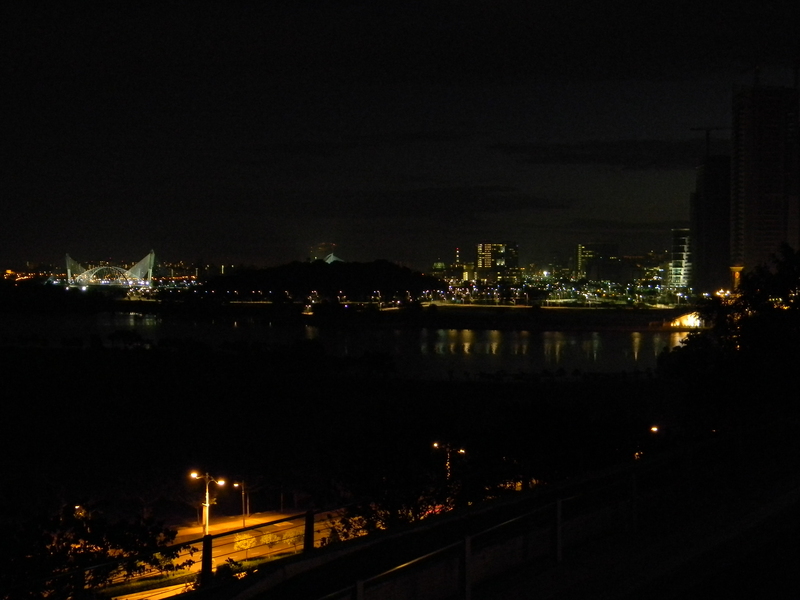 We snapped some pictures and were on our way snaking through the new expressway that heads north. Unfortunately, despite having plotted and even driven this route just days ago, I missed the turn to Subang Jaya, and we ended up practically circumnavigating the city to get back on track. That is the price you pay for the smallest navigational error in this city of serpentine asphalt. 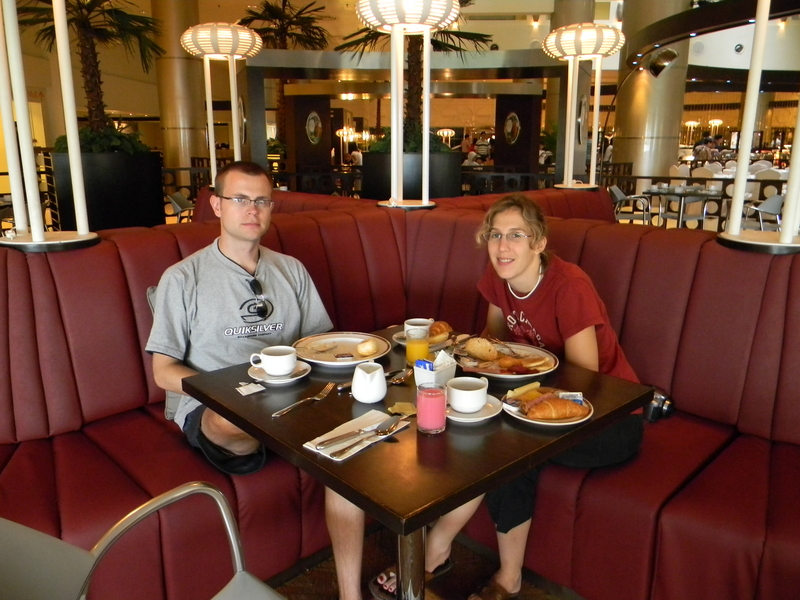 We did get to Sunway Pyramid, and by then we had worked up a bit of an appetite, so the breakfast brunch at the Sunway Resort hotel fit the bill quite nicely. I have promised myself I will go on a fruit and fluid diet for the next three days in penance! Having dropped Jon and Nic at the condo for a wee kip, I headed up to the school to catch the last staff meeting of the year. Despite having my principal’s permission to be absent (thank you Jim, you are a most considerate man!) I just couldn’t leave this one critical task undone. It is at this meeting that final adjustments to marks are made. Although the adjustments are minimal and never exceed the bounds of professional judgment, the one or two marks afforded here can mean the difference of thousands of dollars to these students, or even the loss of their scholarship. We all take this task very seriously. Mercifully the meeting was brief and I got back in time to get in a swim with Jon and Nic at the lovely pool in our condo, and after a quick change we headed back to the school to show off the facility and meet the few folks that were still around. Then it was on to Asia Cafe for claypot of rice and curried chicken for them and some Vietnamese noodles for me (Honest; nothing but fruit for three days!). That gave us just enough time to get back to the condo, repack, and get Jon and Nic back to the airport for their flight up the coast to Langkawi. This time there were no wrong turns, and I got the rental car back under the 24 hour deadline. Please don’t call me dear, I’m going to sleep until noon. I remember now what it was like raising this kid. No wonder I was always exhausted!